Today my look is casual, could be worn to the office or for some cocktails for dinner with girlfriends. A later post will share my night out look with my sweetie, yes my sweetie. Anyways, I got this ahhhhdorable tee at Old Navy for $14.94. They have a ton of cute ones just like this with different sayings. I paired my tee with my Old Navy gingham blouse, not currently found in stores but similar HERE and layered with my H&M blazer for $34.95. I am absolutely obsessed with my Forever 21 pearls for $12.80, I literally wear them everyday with my monogrammed necklace. In light of Valentine's Day I wore my JCrew wool red mini skirt. 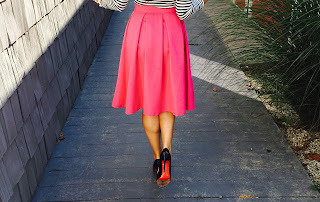 I got this skirt last season, but can be found similar and super cute HERE. 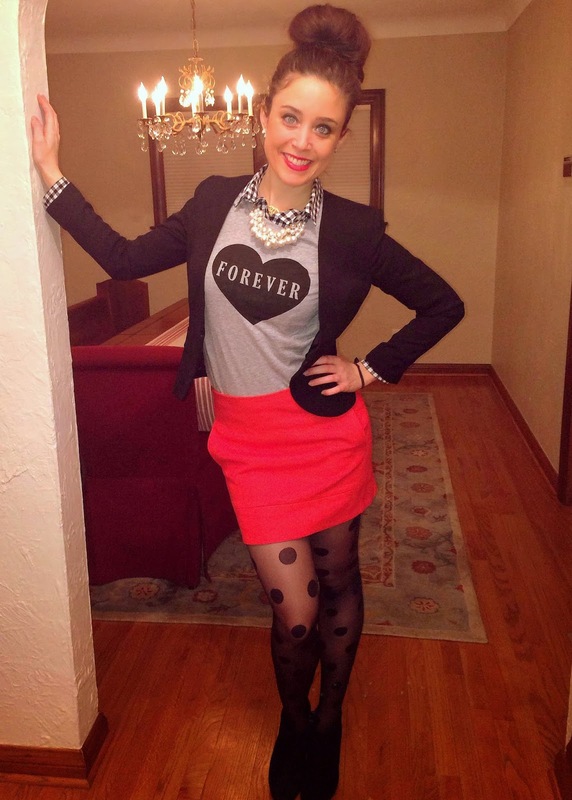 I topped off the look with my Forever 21 polka dot tights found similar HERE and my Aldo ankle boots found HERE. A fun, relaxed look perfect for Valentine's Day! I have learned a lot in this year, one of those things being that TRUE LOVE is worth the wait. I am a very lucky gal these days. :) Happy Valentine's Day Pin Money Girls.